Mack is our first conformation showdog. He finished from the puppy class, owner/handled in his first 6 all breed shows, at 11 months of age. Mack has had an outstanding show career. 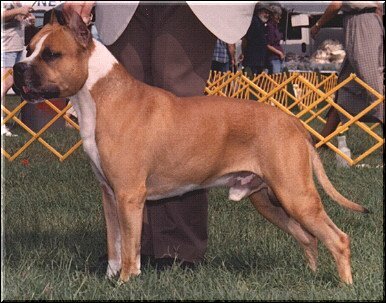 In 1998, he received an Award of Merit at the presigious Westminster Kennel Club dog show, being the largest AmStaff entry to date. He went on to finish in 1998 as the #3 ranked AmStaff in the country. 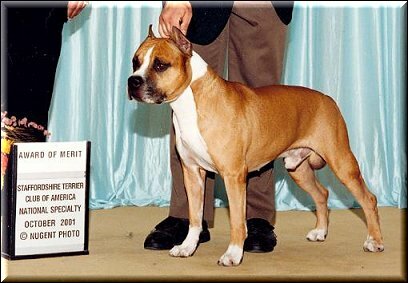 Mack has a great temperament, and relentless drive, which is a characteristic of this breed. 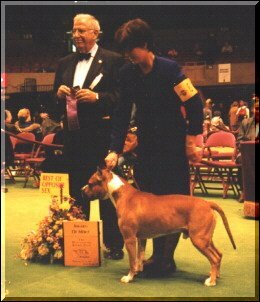 Mack received an Award Of Merit at the National Specialty in Texas 2001 at 6 and a half year's old...Owner/handled! It's with great sadness that we would like to state that CH Mack The Knife Of Almaden passed in Nov. 2004. Ringo is a beautiful brindle boy with tons of flash. 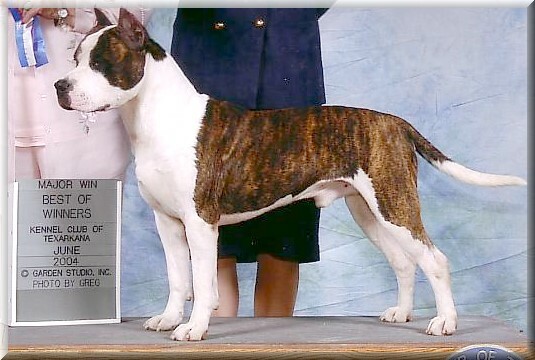 A balanced dog with outstanding movement and temperament..ring presence and just loves to show!